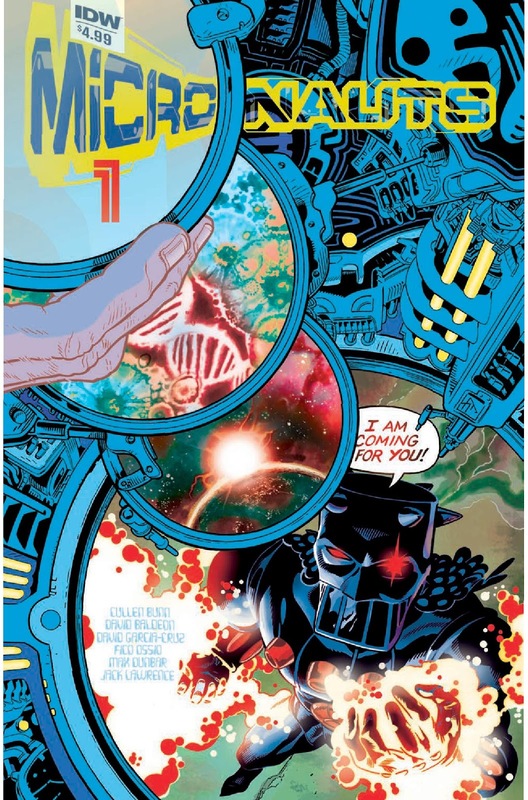 The Fellowship was fortunate enough to obtain a copy of MICRONAUTS #1 from IDW Publishing. The story is by Cullen Bunn, with breakdowns by David Baldeon, finishes by Baldeon, Fico Ossio, Max Dunbar, and Jack Lawrence. The colors are by David Garcia Cruz, Joana LaFuente, Thomas Deer, and John-Paul Bove. The lettering is by Tom B. Long. Oziron “Oz” Rael and his team are tasked with breaking through the Ministry of Defense’s blockade to obtain and distribute medicine. Sounds easy, right? Not really, as things isn’t what they appear to be. Meanwhile, Baron Karza continues his war against the Ministry of Science in an attempt to rule all. While this is going on, the Entropy Cloud continues to grow, destroying every planet that is in its way. The Micronauts are back and IDW has them! I’ll admit that I didn’t get into the comics when they were first published, but making up for lost time in recent years. Cullen Bunn has done an excellent job of setting up characters and the situation with enough action and intrigue that will want you to stick around for more. The art is incredible; every page is so beautiful and colorful. Those who are unfamiliar with the original comics and the toy line won’t have a problem getting into this new series. Try it out! MICRONAUTS #1 is in stores now, or available for ordering at www.idwpublishing.com.